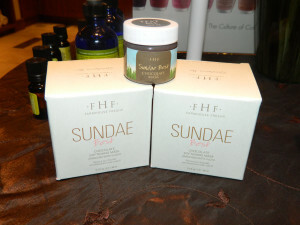 A Crème Brulee Chocolate Pedicure?? Yes, Please! When I saw the sign in the hotel lobby advertising a special on chocolate pedicures, I have to admit I was excited yet scared, intrigued but worried. It sounded great (and delicious! 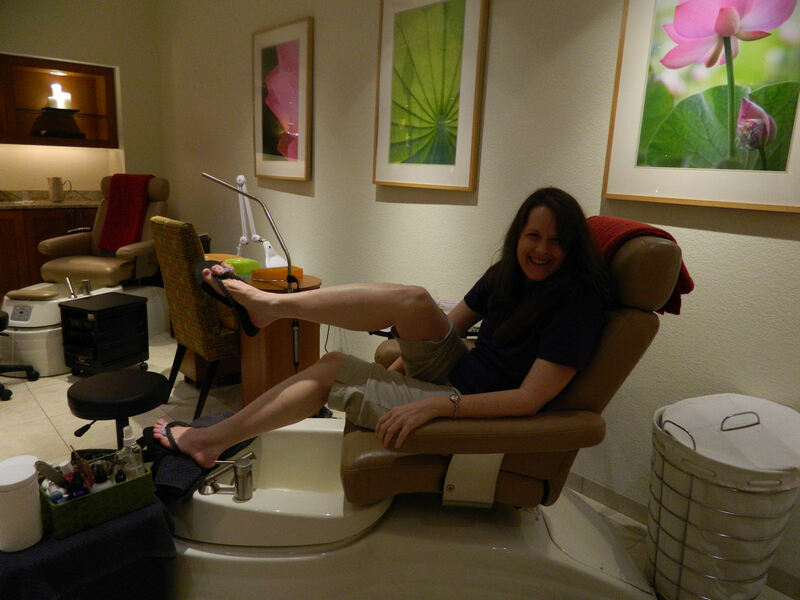 ), but I’ve always kind of hated showing my feet in public – and I had never had a pedicure before. Ever. Would this end up being an enjoyable adventure or just painful and kind of embarrassing? Well, I bit the bullet and signed up and… it was one of the best foot experiences I’ve ever had! In fact, I really need to try to figure out how to work pedicures into my monthly budget from now on. 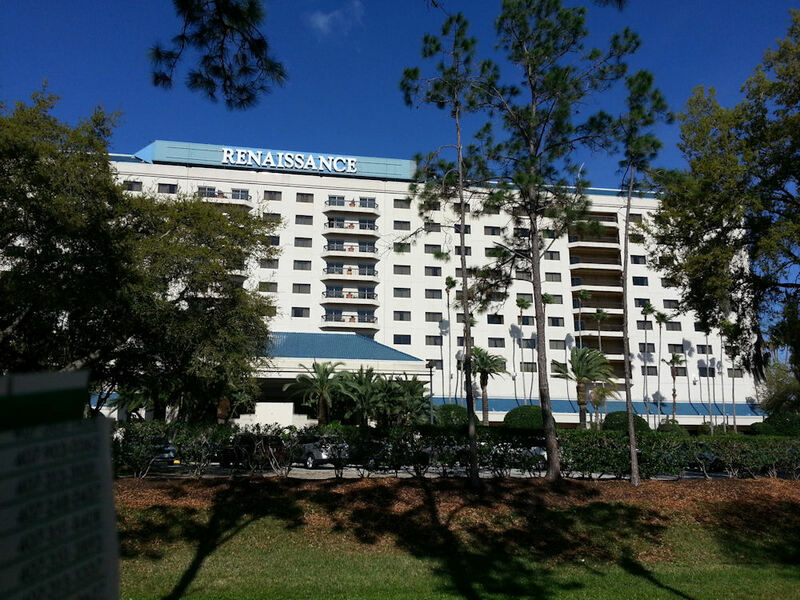 As mentioned in my post yesterday, I spent 4 nights starting last Thursday at the Renaissance Orlando at SeaWorld, which was the hosting hotel for a medical conference I was sent to cover there in Florida. Throughout my running around to sessions and presentations, I kept passing that sign talking about chocolate pedicures being offered in the hotel spa. And by the end of my conference, when my feet were REALLY starting to hurt, I began to seriously consider checking this out. But as mentioned earlier, I don’t like my feet, hate showing them in public, only wear sandals at home, and only wear flip-flops for short steps to a pool. My home-based “pedicures” never turn out looking right and frankly I just find it easier to cover up my feet with cute shoes. Although my friends have always pushed the wonderful benefits of a professional pedicure, I was never that interested. That is until some genius thought to add the word “chocolate” to the description. 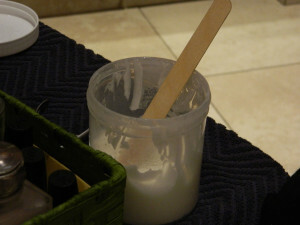 The Moroccan Crème Brulee Chocolate Pedicure at Nèu Lotus Spa at the Renaissance hotel was advertised for $60 (plus tip). But a small mishap with my hotel room door led to a further discount — the battery for the door’s locking mechanism went out, ending with the manager, someone from maintenance, and someone from engineering needing to be called. Although that whole incident took a while, everyone was very apologetic and the manager even offered me a $25 discount for the pedicure to help make up for my inconvenience. So I had to do it! 1) The first step was a “foot rejuvenation” with a milky Moroccan cream and baby powder concoction added to a hot (too hot at first!) bubbling foot soaker. Let’s get this pedi started! 2) Next came toenail filing and cuticle pushing (ouch!) I told the pedicurist right before she started, “Here comes the painful part.” But she replied, “No, none of this hurts. It’s all just relaxing.” She lied. But it was a necessary evil to get to the better parts. 3) After a quick foot massage with a creamy lotion, it was time for heel buffing. Now, I’m crazy ticklish on my feet and shared this information. Still, I think the lady was shocked when just after she started, I burst into squeals of laughter and jumped right out of my chair. From that point on, I just dug my fingernails into the arm rests and tried to act like an adult. NECESSARY EVIL! 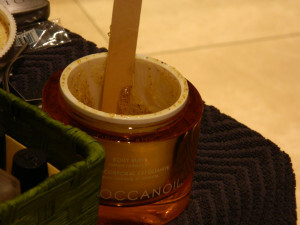 4) The next step was applying an orange scrub to the feet and legs. This was a “Moroccanoil Body Buff” exfoliant and had a heavy, wonderful smell — like one of those candies that look like an orange made out of chocolate. Ahhh, now we’re getting to the good stuff! …and applied to my feet and legs. 6) Then it was time to bring on the chocolate! 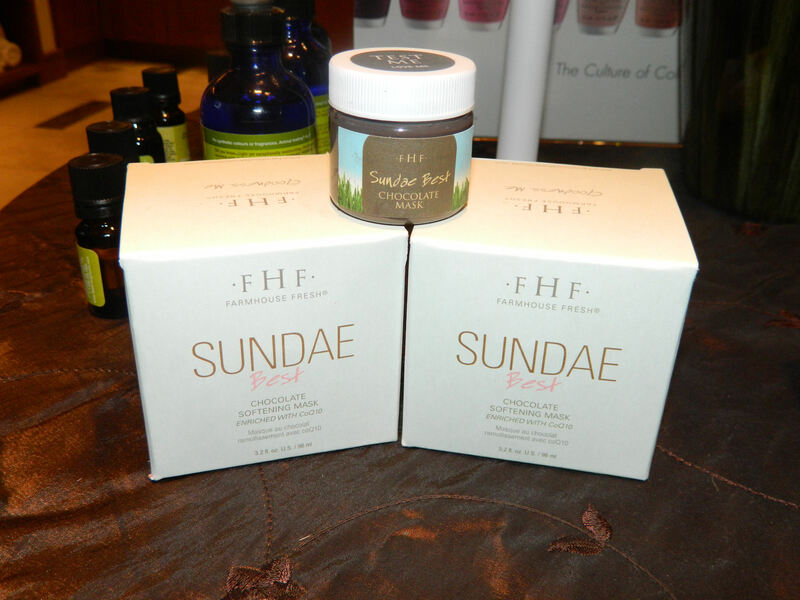 The fantastic smelling FHF Sundae Best chocolate softening mask was liberally applied to both legs, which were then wrapped tightly in warm towels. By now, the smell of orange and cream and chocolate was making me very hungry. My legs smell DELICICIOUS! Is that weird?? 7) While the towels were still on, the pedicurist then applied a layer of clear nail polish and then the bright lavender-pink color I picked out earlier. After the polish dried, all that was left was a quick washing off of the chocolate and then payment. By the end, I was relaxed as a noodle and all but asking strangers to admire my dressed up toes. I also caught whiffs of chocolate for the rest of the day, which kept me smiling. After all, I have tons of barely worn sandals and the newly discovered ability to have cute toes. Bring on summer!! Winced during the cuticle part. Got hungry during the chocolate part. You know, I have a shampoo that smells faintly of chocolate orange and use it all the time, for that reason, only. Most marketers surely are missing something. Thanks for reading! I’ve had orange soaps before but never a chocolate one. If I could, I’d probably get chocolate orange… everything! It’s just such a happy smell. What a wonderful experience. I wonder how long it will be before this is popular all over the country, or is it already? Thank you for sharing your fun adventure with us. What a wonderfully relaxing experience. Sounds like something I would like, but only occasionally so I wouldn’t go broke. Nicely written Deborah. Thanks Darlene! I think you would really like this. And it was definitely worth the cost! 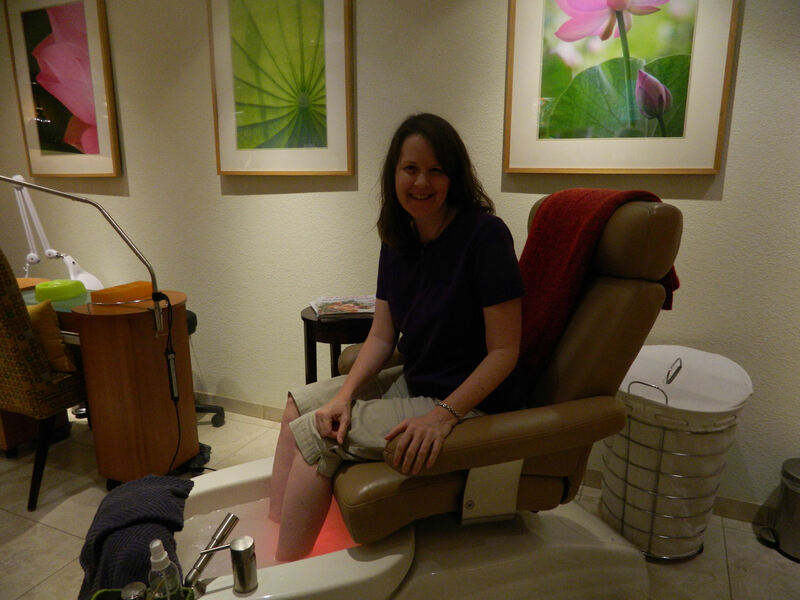 I’ve never really known what was involved in a pedi before…thanks for the step-by-step! You’re welcome Jamie! Thanks for stopping by. 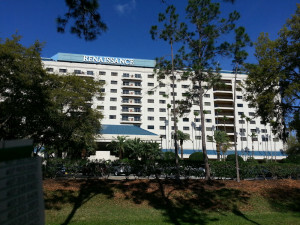 Thank you again for visiting our spa during your trip to Orlando! 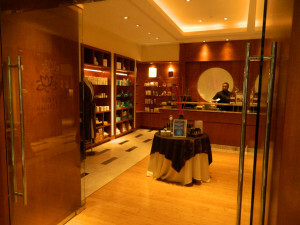 We are happy you enjoyed our special of the month and we look forward to seeing you again at our spa! Thank you for the wonderful pedicure! Can’t wait to see what type of fun combination special you come up with next. I’ll definitely be back! Okay, you convinced me. I carry around the same reservations about pedicures as you previously had but, I’ve been nurturing them far longer than you so it required a good deal of convincing. I sincerely hope I can find the seriously satisfying experience you had with your first pedicure. By the way, hiding your feet all these years is like putting your candle under a basket…your feet look good…bare them…pun intended. Ha – thanks for the feet compliment Sandy. I’m just sad to be back in a cold place where I have to cover them up. I think you should definitely book yourself a pedicure pronto – it really does live up to all its hype! Love pedicures, but never had one involving chocolate. Sounds like a fun one and I don’t think you could ever go wrong when chocolate is involved. Ha! I guess I can understand why pups might not understand the “waste” of a relaxing chocolate scrub Tom. Sounds wooonderful! I hope you continue to treat your feet. If I can look at my toes and they are “done” the the world is alright with me. It really has kind of changed my life. It’s nice to not be ashamed of my feet anymore and wanting to show them off. Just wish I could talk a local place into giving chocolate pedicures! I love pedicures, never had a chocolate, and that one sounded delicious! Thanks for sharing. And it smelled soooo good! Thanks for stopping by and commenting Cheryl. Really appreciate it! Sounds like a “deliciously” tempting treat–for your feet! Nothing beats chocolate. Enjoyed reading this. I felt like I was there and in the chair. Glad I could share the experience – just sorry I couldn’t provide “smell-o-vision” so you could get a whiff of chocolate while reading. Ha!